By David Skolnick | November 3, 2018 at 12:02a.m. Attorney General Mike DeWine, the Republican nominee for governor, said he is committed to keeping health insurance protections for those with pre-existing conditions. This comes as Rich Cordray, his Democratic opponent, continues to say otherwise – and with the Ohio Democratic Party placing an inflatable 13-foot-tall chicken made to resemble Donald Trump near DeWine’s Friday campaign stop in Boardman to emphasize that he is a “chicken” when it comes to standing up to the president on health care. DeWine said if the federal government takes away the coverage of pre-existing conditions, he would make sure as governor that those people were covered in Ohio. Health care is a top issue in the governor’s race with Cordray running television commercials saying DeWine doesn’t support coverage for pre-existing conditions because he opposes the Affordable Care Act that gave people that right. DeWine has his own commercial saying he does support pre-existing coverage. In his first day as attorney general, DeWine joined a Republican lawsuit against the act, also called Obamacare. The U.S. Supreme Court upheld the law in 2012. 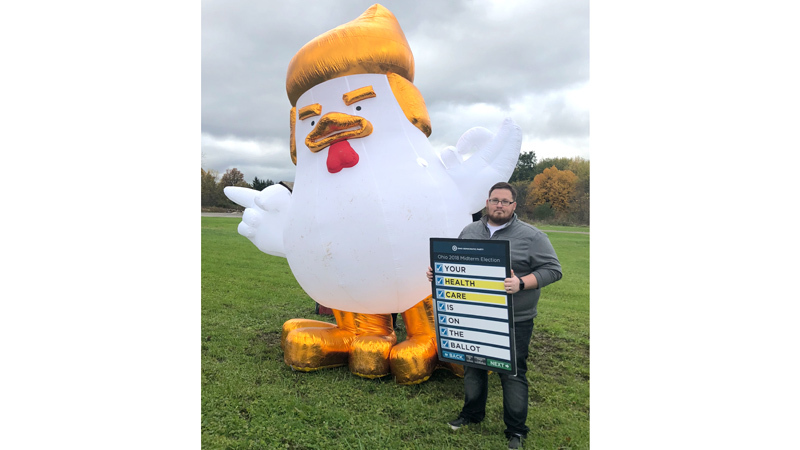 Before DeWine’s appearance, Ohio Democratic Party employees placed an inflatable 13-foot-tall “Trump chicken” across the street from Republican headquarters. DeWine said there’s a difference between opposing Obamacare and opposing coverage for those with pre-existing conditions. “There’s a lot of reasons to not be in favor of the Affordable Care Act,” he said. “That does not mean being against the Affordable Care Act means you’re against coverage of pre-existing illnesses. I can’t imagine anybody not wanting pre-existing illnesses to be covered. “I’ve made my commitment to the people of the state of Ohio very, very clear,” DeWine said. May 5, 2017 12:09 a.m.
September 22, 2018 12:08 a.m.